The White House is a ground floor fully self contained spacious one bedroom apartment. Comprising of: Large lounge, kitchen, laundry/shower, one bedroom with one double king bed (can be converted to two single beds on request). Owner occupies top level, but holiday accommodation has a separate private entrance at rear of premises. 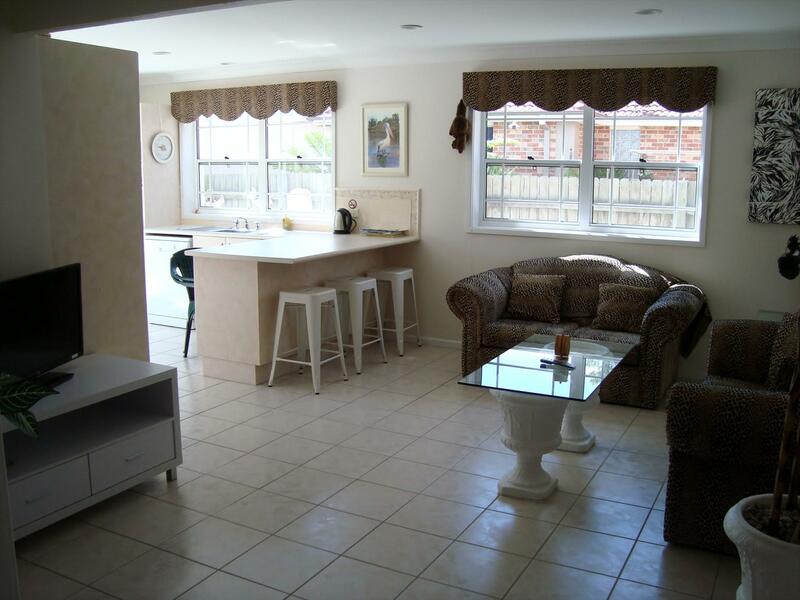 Self catering - all utensils and appliances including dishwasher, washing machine are provided. One minute to beaches, pool and restaurants. Off street parking. Non - smoking. Suitable for one or two people (not suitable for children, babies or pets). - Stretch your legs and wander through the Village, stop for a coffee at one of the many cafes. - Browse through the boutiques, home-wares & shops. - Have a drink on the balcony at the Ocean Beach Hotel, its the best view in town and the Restaurant is excellent. - Enjoy a stroll along the walking track to Bass Point Reserve. Cancellation if caused by the client money paid is not refundable unless the house is re-let for the entire period. If it a refund is made due to the property being re-let then a $50 cancellation fee will apply. The owners will make every effort to ensure the property is available as booked. However the owners reserve the right to make alterations to bookings due to unforeseen circumstances. Parties and Functions are strictly prohibited. The price charged is for domestic use only and not commercial. Accordingly this rate does not allow for the extra wear associated with functions in terms of cleaning garbage removal wear and tear repairs etc. Use contrary to this may result in loss of your bond and/or additional payments. Damage Breakages Theft and Loss are the tenants responsibility during their stay. Departure - the property should be left in a similar state to its condition on arrival. Check-out time is 10.00am by the latest to allow time to prepare property for next guests. Disturbance to our neighbours including excessive noise is prohibited and may result in termination of rental. Guests of tenants must depart the property by 10.00pm.